The two groups said suggestions that they had actually sought discussions with the government on the issue were misleading. But both told BBC News Online that they would expect to be involved in any opportunities in the area following a conflict. "Shell, like most oil majors, aspires to have commercial activities in the major resource holding countries of the Middle East," a spokesman for Shell said. Shell said a report in the Financial Times newspaper - suggesting that both groups had held talks with Downing Street and Whitehall officials on the subject - was "highly inaccurate". "The subject has only come up in normal conversations that we have," Shell said. But the group has repeatedly argued for what it calls a "level playing field" in the event of post-war development of Iraq's oil fields. "Shell believes that the management of the Iraqi energy industry and the involvement of foreign oil companies in the aftermath of any conflict with be a matter for whichever authority is in place," the group added. BP also insisted that any mention of opportunities in Iraq had taken place "en passant" and that no specific talks had taken place. 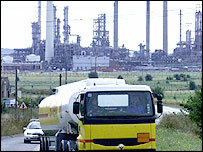 But BP told BBC News Online that it had been talking to other government departments and companies. "(They) have been asking for our view of what might happen. "We have been talking to others when asked," a spokesman for the group said. The oil company insisted it had never initiated these discussions itself. According to the FT, news of the oil groups' interest has prompted further criticism from MPs opposed to the potential war. It reinforces the sceptical view that a large force driving the call for conflict is Iraq's huge oil supply. 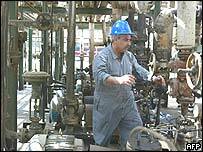 The price of oil has soared as the prospect of a war in Iraq intensifies, prompting fears that supplies would be disrupted. But Opec ministers voted earlier this week not to increase output quotas and sought to reassure markets that a war with Iraq would not hamper supplies.